Orig. by controlled cross (‘Moore’ X ‘Success’) made by L. D. Romberg, USDA-ARS, Brownwood, TX. Cross made in 1937 in the orchard of John Barton, Sr., of Utley, TX. Seedling recorded as 37-3-20; first fruited in 1944; tested as T-15, released in 1953. 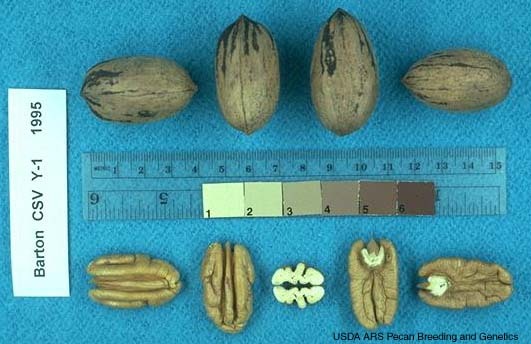 Nut: elliptic with obtuse apex and acute base; round in cross-section; shell suture usually dark at base; 48 nuts/lb, 57% kernel; kernels golden in color, with deep secondary dorsal and ventral grooves. Late to break buds in spring, with ‘Stuart’. Protandrous, with mid-season pollen shed and mid- to late-season receptivity. Precocious and prolific, with a tendency to overbear with maturity. Ripens early mid-season. Resistant to scab. Recommended (1990) for homeowner plantings in MS. Extracted from here. The above says they are 48 nuts/lb that would be a large nut. The nuts in 2018 were not that big but were clearly that same shape nut and kernel. In the 1975 Study of South AL pecans, they show one year where the Bartons were 70 nuts/lb. So, Barton appears to be the best choice.